Directions: Take 2 capsules, 2-3 times a day, 30 minutes to 1 hour before meal. The Operation BIM research focuses on ways of balancing the immune system using products derived from natural plant extracts. Below are the causes and symptoms of osteoarthritis and rheumatoid arthritis; and the efficacy of BIM products in treating both. Osteoarthritis is the most common form of arthritis and is the result of the wearing down of the protective articular cartilage, which covers the end of bones in major joints of the body such as the knees, hips, and spine. As the cartilage degenerates, the body tries to repair itself and forms new bone growth known as bone spurs or ‘osteophytes’. The bone spurs cause pain when they rub against existing bones and tissues. As the cartilage degenerates and bone spurs form, there is a decrease in mobility in the joints and movement becomes painful. The formation of bone spurs also causes deformation of the joints where the combined outcome is restricted mobility in the joints and their inability to take the body’s weight causing instability. The main cause of osteoarthritis is the natural aging process of the body and the general wear and tear of the joints. Excessive use of the joints may increase the advent of osteoarthritis. Genetics, or have suffered from other forms of arthritis, plays a part in the likelihood of one suffering from osteoarthritis. Although being overweight is not the main cause, it is a contributing factor that might trigger osteoarthritis. Osteoarthritis usually begins with joint pains in the morning and when exercising. Other symptoms include slower movement and general pain in the joints, and hearing a grinding sound when moving the joints. There is also swelling in the tendons and tissues around the joints caused by the friction of bone spurs, which also leads to the weakening of the muscles around the joints. The main characteristic of this disease is the extreme loss of the articular cartilage due to the degeneration by key mediators in the body. Therefore, the only way to decrease pain in the joints is to prevent the degeneration of the cartilage and decrease the inflammation of the joints, thus allowing them to work more effectively again. Rheumatoid arthritis is an autoimmune and chronic disease in which the body’s immune system – which protects your health by attacking foreign substances like bacteria and viruses – mistakenly attacks your joints. The initial symptoms are pain and swelling in the joints, especially the fingers, feet, and ankles. In serious cases, there will be major swelling and the bones will degrade until they become deformed, eventually leading to disability in chronic cases. 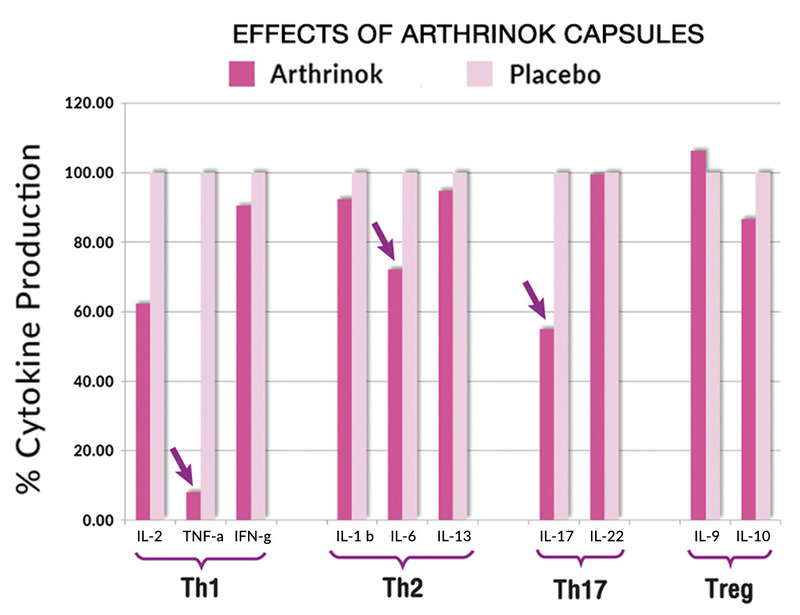 Volunteers who took 4 Arthrinok capsules per day for 15 days showed a decrease of TNF-a, IL-6, and IL-17 which lowers the severity of inflammation. Both osteoarthritis and rheumatoid arthritis are caused by the white blood cells over-releasing inflammatory mediators IL-1B, TNF-a, IL-6 and IL-17 that result in inflammation. *Clinical studies on the effects of Arthrinok capsules done at the Biomedical Technology Research Centre.